NEW SILENT CINEMA: IT’S ALIVE! 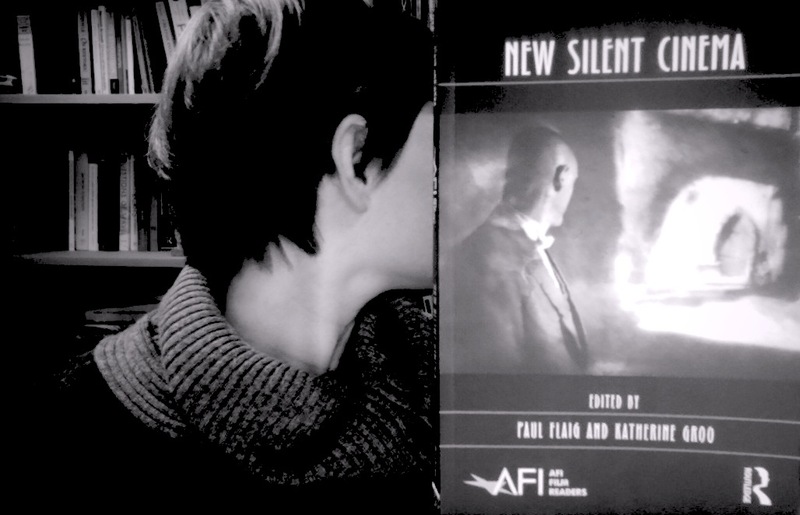 I am delighted to announce the publication of New Silent Cinema, a collection I co-edited with my fantastic colleague, Paul Flaig. The book features essays by a group of outstanding screen scholars–including Constance Balides, James Leo Cahill, Brianne Cohen, Jonah Corne, Brian Jacobson, Rob King, Jennifer Peterson, Brian Price, Catherine Russell, Yiman Wang, and Joshua Yumibe–as well as interviews with Paolo Cherchi Usai, Rick Altman, and Guy Maddin. We are especially grateful to Guy Maddin, who not only allowed us to publish several beautiful images from his ongoing Séances project, but also gave us permission to use an image from his most recent film, The Forbidden Room (2015), for our cover. New Silent Cinema explores the recent wave of interest in silent cinema as it stretches across popular and avant-garde film, contemporary art, literature, and new media. The introduction is available to peruse here. Paul and I will soon post a conversation about the development of the project, the many examples of “New Silent Cinema” that did not make it into the collection, and the diverse directions that our contributors took in examining this contemporary phenomenon. We are very grateful to everyone who supported the project–and look forward to hearing from readers! Every couple of years, I teach a course on “Minor Cinemas,” which takes the concept of “minor” literature from Deleuze and Guattari and explores whether/how the concept might be useful for thinking about a range of film practices. When I began teaching the course about six years ago, I included a week on “short cinema,” in which I taught a smattering of advertisements, music videos, and trailers. I am headed to Montreal tomorrow for the annual Society for Cinema and Media Studies conference. This year, I am lucky to be on the provocatively entitled panel “Where There’s Smoke, There’s Fire” with Brian Jacobson (St Andrews) and Jocelyn Szczepaniak-Gillece (UW Milwaukee). We will each be discussing the intersection between fire and film history, and Mary Ann Doane has kindly agreed to respond to our papers. My own contribution to the panel, “Let it Burn: Film Historiography in Ashes and Flames,” tries to reframe the flammability of film as an intrinsic property of moving image artifacts (rather than a threat to their survival). I trace the figure of fire as it emerges in ancient philosophy and circulates in philosophies of history in the modern era. For the first time in a long time, I will be giving a paper without any images or clips. I am excluding examples in part because the paper is not motivated by any one film or kind of film—and I am hoping to make a more inclusive metahistorical claim. However, I began drafting the project by returning to fires in early cinema—from Georges Méliès’s La Danse du feu (1899) to Mary Jane’s Mishap (G. A. Smith, 1903)—and considering how these works represent fire and register the flammability of film. In Méliès (as for Nietzsche), fire is Dionysian revelry and dance; it is a generative, creative figure that coincides with the female body; and it is also a site of visual play, of appearances and disappearances. In Smith’s comic Mishap, an explosive fire tears the female body into pieces, but also reanimates it as a cinematic specter. Indeed, fire in early cinema always seems to teeter between processes of annihilation and animation, the indexical and the iconic. The paper is also influenced by the work of structural filmmakers like Paul Sharits—whose interest in the materiality of film returned him at several points to film fires and burns—as well as more recent experiments in digital video by artists like Thorsten Fleisch [see the link above and here]. 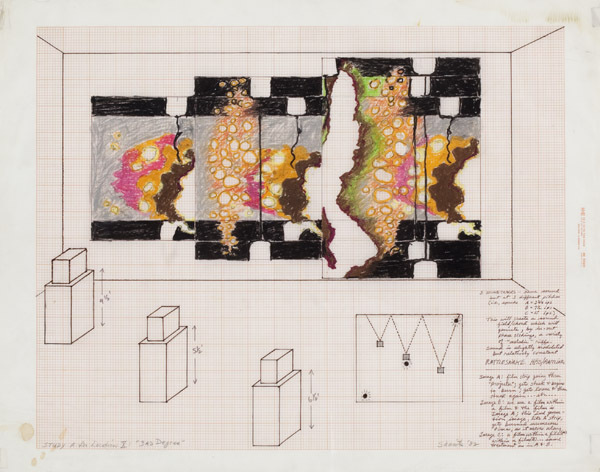 I had the opportunity to see Sharits’s Third Degree installation at the Greene Naftali gallery a couple of years ago. 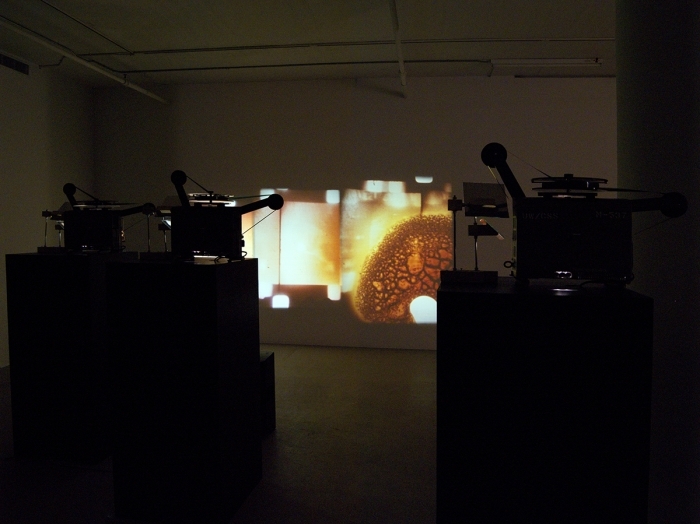 The installation consists of three film loops, projected side by side. On the first loop, we see an image of a match being lit and waved in a woman’s face. The image occasionally gets stuck and begins to burn (in the film, not in the actual screening), as if from the heat of the projector’s bulb. On the second loop, we see what Sharits describes as a “film within a film,” a recording of the film from the first loop. This image, too, gets burned numerous times. Finally, on the third loop, a “film within a film within a film…same treatment.” The image on the third loop is larger than the others and now barely recognizable. Crucially, Third Degree does not simply ask us to see film in all of its material fragility and contingency–and to mourn the losses indexed by scratches, stutters, and burns. It instead presents the dissolution of film as a process, one that both destroys and reassembles (and one that mimics the preservative process of making copies of copies of copies…). The final loop or “third degree” preserves the trace of its previous iterations–including the image of the match, the woman’s face, and the burns that gather on the surface of the actual film–but it also radically departs from these origins and offers something to the living present. Indeed, in projecting these films in the gallery, Sharits invites spectators to circulate between the images and the projectors; to see their own shadows mix with all the others; and to consider the role we always, necessarily play in reanimating film history. My latest edition of Archival News is available here. 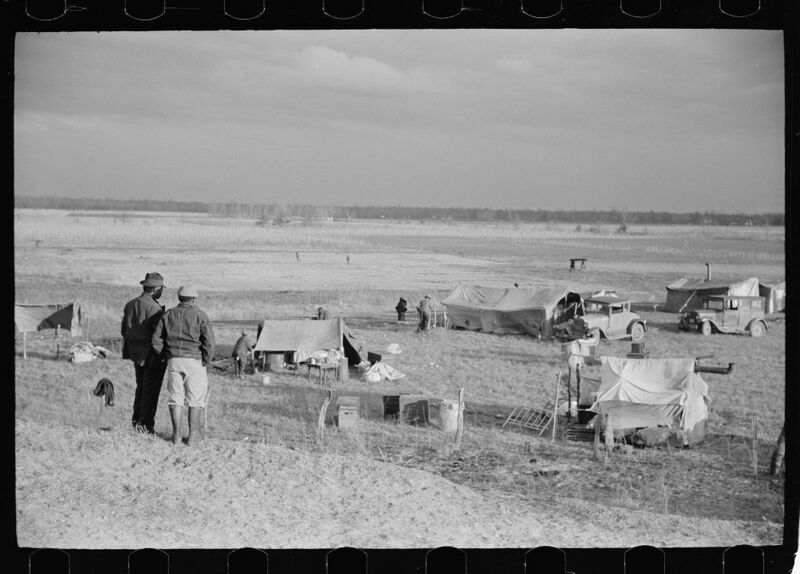 One of the most interesting projects I stumbled upon this time around was Yale’s Photogrammar, a web-based tool for organizing, searching, and visualizing the images produced between 1935-1945 as part of the Farm Security Administration—Office of War Information (FSA-OWI) photographic project. The Photogrammar platform gives you the ability to search the images by photographer. It also offers an interactive map that lets you gather geographical information about 90,000 photographs in the collection. The Photogrammar project was funded by a grant from the National Endowment for the Humanities (NEH). Directed by Laura Wexler, the project was undertaken by Yale’s Public Humanities Program and its Photographic Memory Workshop. You can learn more about the genesis of the project and its technical challenges here and here. For the last month or so, I have been developing a new blog for the University of Aberdeen’s George Washington Wilson Centre for Visual Culture. I am a member of the Centre and its Associate Director; I will also be making occasional contributions to the GWW blog. I just posted my first piece, “Object Lessons,” which reflects on the recent cancellation of Exhibit B at the Barbican in London. I operate under the theory a movie should work with the sound off, and under that theory, staging becomes paramount. Soderburgh describes this project as a process that simplifies the image, strips it down. The assumption here is that black-and-white images and contingent sound allow viewers to concentrate their minds (on staging…). However, there’s nothing all that simple about this audio-visual concoction, which brings the tools of silent cinema together with the golden age of the Hollywood blockbuster and the sounds of its collapse in the era of social media. 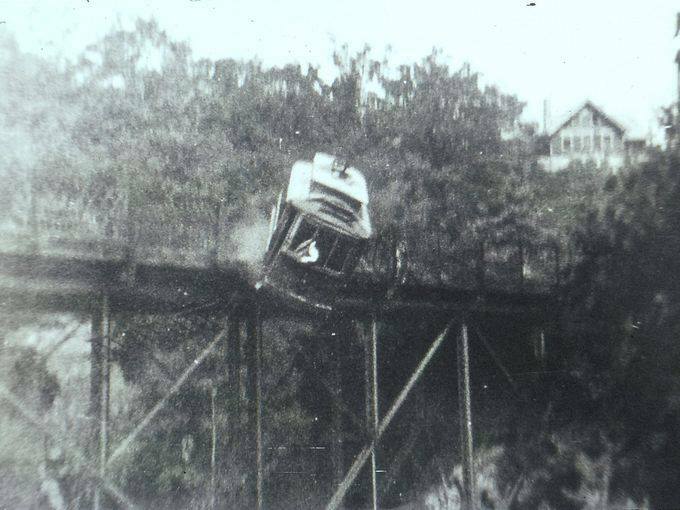 The Ithaca Silent Cinema community celebrates the 100-year anniversary of the famed Stewart Bridge trolley crash, staged for the Prince of India (Wharton Brothers, 1914). More information on Ithaca’s history in silent cinema can be found here. And if you are wondering whatever happened to the Wharton Brothers’ films: check the bottom of Cayuga Lake.